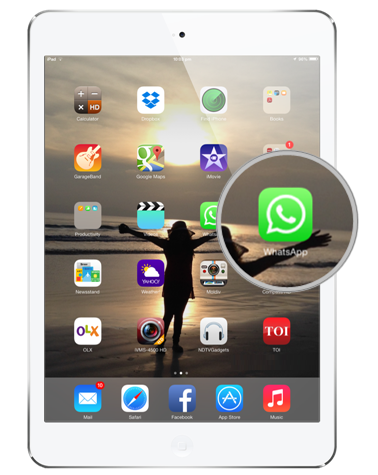 Following article explains how to download WhatsApp for iPad, iPod and install it on supported iOS devices. One thing that is very difficult to get on the iDevices is the normal apps which rest of the Android phones provide. The main problem arises because whether it is an iPad or an iPod one needs to jailbreak it and then find a way to download all the apps that one wants. Here is a technique to download Whatsapp which is an instant messaging app which everyone wants nowadays. If you have iTunes on your PC then you can easily skip these steps, if not you have to download and install it on your PC. Through iTunes itself you can download Whatsapp so that you get the .ipa file of that for further use. Select ‘iTunes Media Folder’ and taking into consideration the OS that your computer runs on the files can be found in different locations. Find the file which will be under the name ‘Whatsapp’ and copy is to your PC the location being irrelevant. iFunbox is what you need to install after downloading n your PC now. Next step would be connecting your iDevice to the PC and then running the file named ‘iFunbox’. Select ‘iFunbox Classic’ and install it. Followed by selecting the ‘Whatsapp’ file that you have just copied. You have to wait for a while till the iFunbox displays a success message after which you can disconnect your device and enjoy the newly downloaded messaging app on your iDevice just the way you want it. Supported iOS Devices: Apple iPad Air, iPad Mini, iPad with Retina Display, iPad Mini with Retina Display, iPod Touch, iPod Nano.